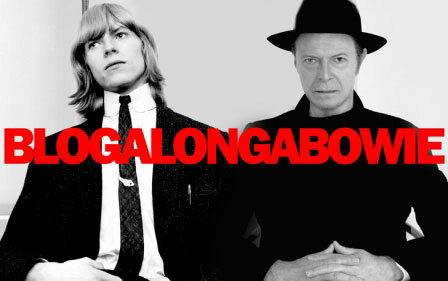 Bowie Wonderworld Columnists: Blogalongabowie - Why Blogalongabowie? Because I am a lazy writer, and I felt that a year-round blog exercise, purely for fun, would be a good exercise and an enjoyable challenge, and some people might enjoy my witterings. I've been a David Bowie fan ever since I saw Labyrinth at the cinema for my 11th birthday in January 1987. This January, I turn 38 in a few weeks. I've been a David Bowie fan for a significant amount of my life. His work has been an abiding passion of mine, seeing me through the first stirrings of puberty through to life as a teenager and young adult right up to not much older or wiser thirtysomething, and through the ups and downs of the past quarter-century of Bowie's career, from the late '80s fallow period, through Tin Machine (I'm a fan, just so you're prepared!) and his return to form as the elder statesman of alternative rock, and 2013 surprise end to a decade-long absence from the studio, so this will be a personal appreciation of his work. I can't guarantee probing critical analysis - but it will be affectionate, enthusiastic, unashamedly subjective and fun. For me, anyway. And hopefully for you, too, dear reader. Feel free to interact and respond, and ask questions. I'll be alternating between looking at his studio albums in sequence and cutaways to other areas (e.g. TV appearances, collaborations, bootlegs, whatever springs to mind etc.) and the occasional guest post. Hopefully, over the course of these entries, you'll also gain an insight into what David Bowie's music means to me and why he's been such an enduring presence in my cultural life and inner world.